The winners have been posted on the American Artist website. 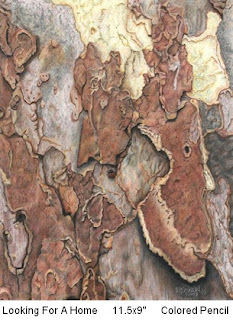 The Colored Pencil artist John P. Smolko took the Grand Prize. Absolutely wonderful, he has such a unique style; you must take a look at his work. The competition has eight categories; Acrylic, Colored Pencil, Drawing, Mixed Media, Oil, Pastel, Printmaking, and Watercolor. 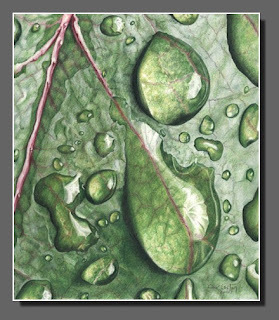 My Raindrops piece took Second Place in the Colored Pencil category. It will appear in the December issue of their magazine along with the other winners. Until October 30, 2007, you can vote for People’s Choice in all the categories. Voters much be or become members of their website forum. Not a bad thing, especially if you are an artist; and it’s easy. Enter an email addy, a password, then verify that you really exist through an email message they send to you, then vote. But give yourself some time and enjoy viewing all the wonderful art that made the semifinals of the American Artist Competition. Thanks to all of you who made it out for the opening reception of Landscape Bodyscape. It was indeed a festive night. Food, drink, music, friends and art all in the same place, can life get any better than that! The gallery tallied 110 visitors for the evening. The next day was pretty much a lost cause though, I was a vegetable. Think I spent the day watching golf and napping, emphasis on the napping part. 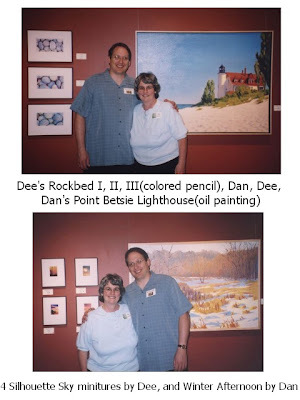 As you can see by the pictures, this gallery doesn’t have the plain white walls that most galleries use, but it works. In some cases, the artwork blends and flows with the walls, other times the wall color causes the art to pop right out. So, if you have a lot of art work that you want to showcase in your home, don’t believe that you need to restrict yourself to just light colored walls. The exhibit is up through the 29th of September for those of you in the Ypsilanti area who would still like to stop in and look around.Thanks for reading and have a grand day!